Today I’m wrapping up our 2017 recap with a look back at some of my personal favorite posts from 2017! We’ve already covered fun DIY projects, favorite cocktails, sweet baby shower invitations and birth announcements, playful and colorful wedding invitations, and romantic and understated wedding invitations – all of which I absolutely love – but the posts below are a bit more personal in nature. I’m planning to write a bit more about my goals for 2018 next week, but one of those goals is to share more personal content, from conversations about motherhood and family to sharing more behind-the-scenes peeks to exploring more of DC. I used to share way more personal content, before Instagram became the thing it is today and before I had two kids (I honestly have no idea how any of you with 3+ kids manage to stay sane! ), and I really miss it! I’ll also be doing a reader survey next week, but if there’s anything in particular that you’d like to see from me this year, please let me know in the comments! One of my goals for 2017 was to get myself in front of the camera more often, which is DEFINITELY stepping outside of my comfort zone since I’m used to being the one behind the camera. But at the end of the day, it’s just me behind this mighty little blog, and it’s important to show my face more often. I teamed up with photographer Anna Meyer to visit some colorful walls in DC, and I can’t wait to do another installment in 2018! 2017 was a fairly big and transformative year – I celebrated my 9th blogging anniversary and introduced you to Common Room Studio! So far I’ve shared the design inspiration for Common Room Studio and we hosted our first set of workshops, but I still need to do a full reveal! Stay tuned in 2018. 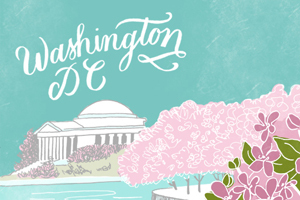 Oh, and if you’re in the DC area, you can sign up for our newsletter right here! On the home front, we shared our backyard makeover and talked about kitchen renovation inspiration! These days, my back yard looks more like a winter wasteland since everything has died back from the freezing temperatures, but I can’t wait until it looks like this again in the spring and summer! Oh, and we may have kickstarted our long-awaited kitchen renovation over the holiday break, so stay tuned for an update on that, too.